"Steward of the Stars?" a little blue Aisha repeats without much enthusiasm, turning over a dusty scroll in her tiny hands. The glance she offers to her elder sister is skeptical at best as she pouts, cheeks puffing outward. "Is that even a real title? Sounds kinda silly to me- I mean, who would even call themselves that? It's not a very impressive name." "You don't think so?" chuckles the yellow Aisha at her side, leaning forward to better inspect the parchment in her sister's grasp. Although it is worn and yellow with age, the carefully written text is legible albeit considerably faded. Pale remnants of what might have been swirling clouds frame the dull edges of the scroll, giving the literature a humble appearance. "Alright then, let's hear it; what's a better one?" "Oh, you mean aside from anything else?" The child extends the scroll back to her sister, who stands across from her with a growing smile. She offers an impatient huff when the yellow Aisha pretends not to see the gesture, rolling her eyes at being ignored. "Fine, fine. How about the Slayer of Soup," comes her first suggestion, "Or the Brute of Bowls? Both of those sound a lot more intimidating than someone who goes by 'Stewer of the Stars'! You can't stew stars. Is this some kind of recipe?" "Aishu," begins the elder sister, lips twitching into a grin as she can no longer contain her amusement. "It's steward, not stewer: someone who is more like a butler of sorts. Sometimes they work with stew, but that's not necessarily their ah... primary concern. It really depends on what they're hired for." "Oh," says Aishu as her cheeks flush with embarrassment from the misunderstanding. "Slayer of Soup still sounds a lot more classy, though." She makes sure to point this out. Her eyes trail down to the scripture as she prods at one furled corner idly. "So wait. That makes this story- you did say it was a story, right?" Aishu waits for her sister to nod before continuing. "This means it's about some cosmic butler, or whatever?" Her features are alight with curiosity now as she cants her head to the side, while the yellow Aisha is trying hard not to laugh at her description of the steward. "You can't really serve the stars. They're not alive, Nami!" Her yellow sister is waving one hand dismissively as she steps to one of the tables in the library, signalling that Aishu should join her with the scroll. With a bounce in her step the little blue Aisha joins Nami at the table, setting the parchment down over its surface. Together the sisters unfurl the document with great care and the elder of the two begins to read. "As the fable would have it," Nami says with a tiny smile playing on her lips, "Your so-called cosmic butler is actually a Hissi that goes by the name of Arhk. In fact, the only reason he's named Steward of the Stars seems to be for his stargazing tendencies." Aishu sets her elbows on the table with a creak. "That's a much, much better sounding name. But if he loved stars so much, what's with the clouds on the scroll?" The young Aisha jabs a finger at the crinkly parchment, waggling it at the faint illustrations of clouds. "Did Arhk really like to fly around? Or maybe he was a cloud Hissi?" "Not exactly. Arhk was actually a Maractite Hissi." Nami traces one finger along a line of faded text, nodding to the cracked painting of the great serpent in mid-flight beneath the words. 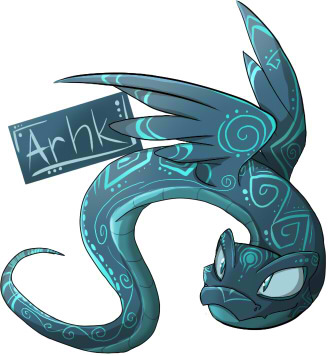 His scales are a rich teal in shade, complimented by a much lighter underbelly. Littered across his body are the tell-tale runes of Maractite, making a striking contrast of hues when set against the dark scales. While his eyes are pale they have an almost luminous quality about them, staring up hopefully from the dull parchment they are bound to. "As far as flying goes, you're quite right!" Nami taps the next segment of text. Underneath it are poorly sketched blue lines in a wavelike pattern. "His love for the sky is written to be infinite. In fact, Arhk adored flying so much that he even lived amidst the clouds over the sea, never touching the soil of Neopia." "Hold up! How is that even possible?" Aishu tilts her head, looking absolutely perplexed. "Even the strongest Hissi would have to land sometime, right? Magical ones too! I think that part's just made up." "As extraordinary as this writing is turning out to be, I think it was possible." Nami gestures to the next piece of the scroll. There appears to be what might have once been a white castle sitting on a cloud, though now it is flaking and difficult to view. Its towers are broken and torn with the paper. "There was a citadel made entirely of cloud that he called his home. It drifted with the wind and storms, never lingering in one spot for long. It seems that to some degree, Arhk may have had some control over the direction the cloudy keep flew in. It's hard to say for certain, of course. Though he seemed to be very fond of the ocean as well. It is said that the only domain he dared not tread upon was the land itself, for reasons unknown." Nami pauses, shaking her head as she reads on. "There's a bit of speculation here about why, though a lot of the notes sound farfetched. I mean, really!" Nami utters a short laugh, gesturing to the writing. 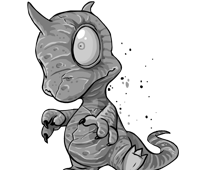 "Some claim he was an ancient creature of evil that was banished from the shores of Neopia long ago. This one says he holds a grudge against all land-dwelling creatures for stealing a precious treasure from his lair. Here, someone writes that Arhk was cursed. Is that everyone's reason for strife these days? A curse did it?" "Maybe someone really did throw a curse at him!" Aishu protests, though her sister is already waving this off as being nonsense. "What makes you so sure that it has to be some other reason, then?" "Think about it," says the elder sister. "Way, way up in the clouds you've got your own personal castle in the sky. As if that isn't amazing enough, below is the ocean: big and blue and beautiful, as far as the eye can see. Above it all you could watch the clouds in the day as they turn incredible colours and shapes. At night when the moon rises up and all the little stars begin to shine... you have the most beautiful seat in all Neopia. Why would he ever want to come down at all? I think he'd have all the reason in the world to stay up there, if only because it brings him happiness like nothing else." "Yeah," Aishu replies, looking thoughtful as they reach the end of the parchment. She pulls the scroll close, giving another searching glance to Arhk. "But wouldn't it be really lonely up there all by yourself?" "I think happiness is exactly what we make of it, and we each find it in different places." Nami offers a smile to her little sister. "Perhaps Arhk found that life can be lived, and life can be loved alone."